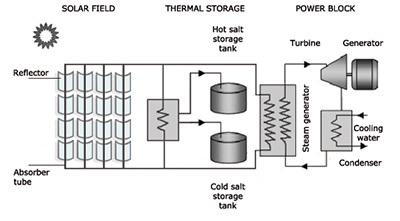 Thermal energy storage (TES) systems can be considered a key aspect for concentrated solar power (CSP) plants, as they provide not only dispatchable electricity, but also stability to the electricity network in case of high fraction of renewable production or intermittences due to weather conditions. 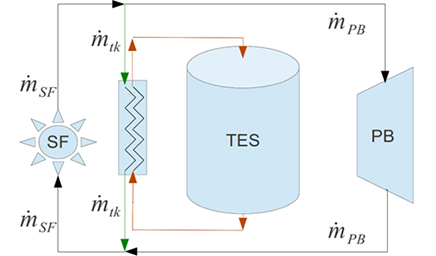 Within the European Tesconsol KIC InnoEnergy Project, two advanced codes, called STEScode and LTEScode, were created for the design and optimization of TES systems in CSP plants. The codes can also be used as engineering analysis tools and innovative solutions for industrial applications. The STEScode allows detailed thermal and fluid dynamic analysis of sensible two-tank TES systems. Situations related to direct or indirect two-tank systems working with any kind of storage fluids can be fully analysed. 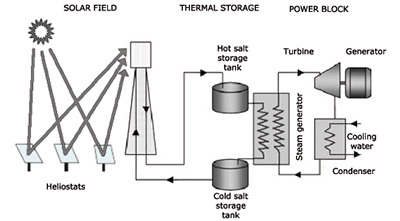 The figure below shows a heat transfer flow diagram of one of the tanks (cold or hot) of the TES system working with molten salts. 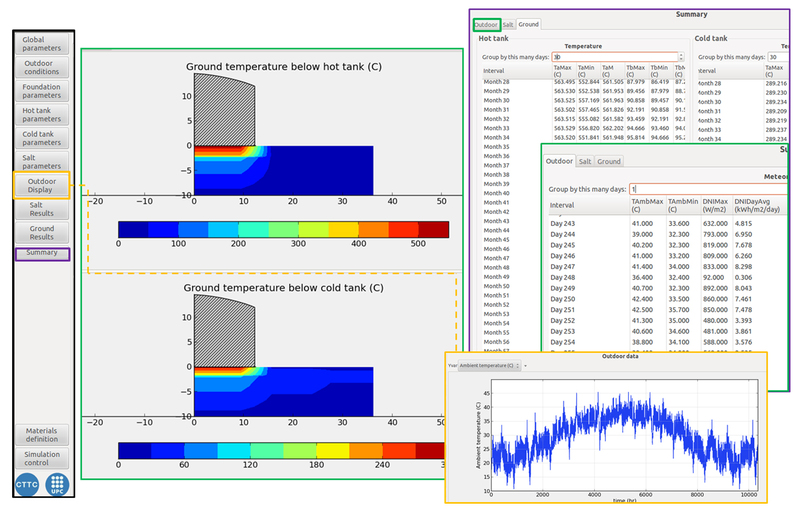 The LTEScode allows detailed thermal and fluid dynamic analysis of single-tank sensible and/or latent storage systems. Specifically thermocline-like units filled with encapsulated PCMs and working with any kind of storage fluids and filler materials. 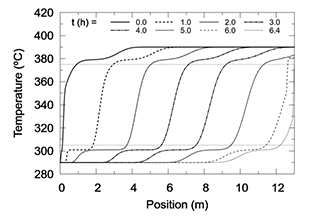 The figure below shows the heat flow diagram of a standard thermocline system. Apart from that, the multi-layered solid-PCM concept, a new kind of thermocline-like thermal energy storage, has been studied for CSP applications. The concept consists of a storage tank filled with a combination of solid material and encapsulated PCMs, forming a multi-layered packed bed, with molten salt or any kind of fluid as the storage heat transfer fluid. 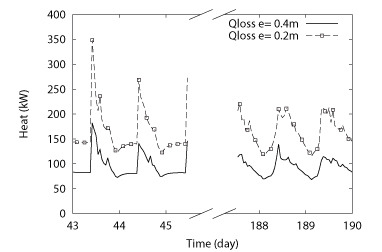 Both codes allow the analysis of the dynamics of the system (transient behaviour) under real working conditions. The STEScode allows the simultaneous simulation of the two tanks in the two-tank TES system considering different operating conditions and considering direct and indirect storage systems (see figures below). LTEScode has been designed to consider arbitrary operating control conditions within the plant, according to the electricity production targets. 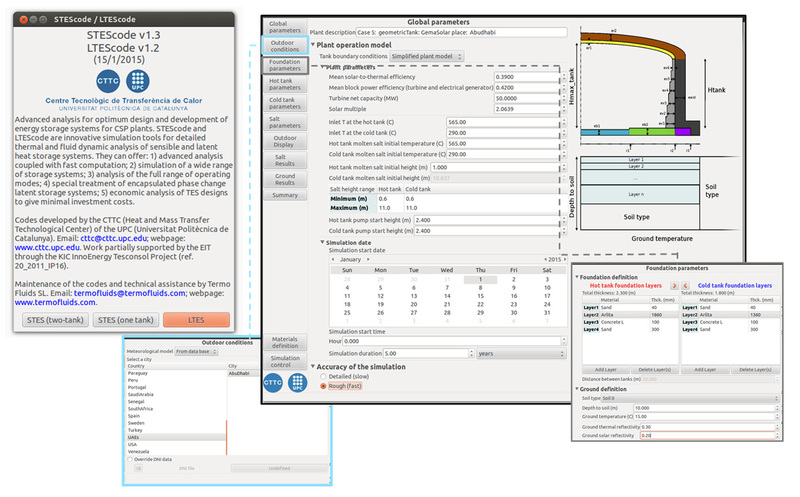 These tools have been designed for visualizing and summarizing the relevant results. Detailed cost estimation for materials used in the defined global system is given. 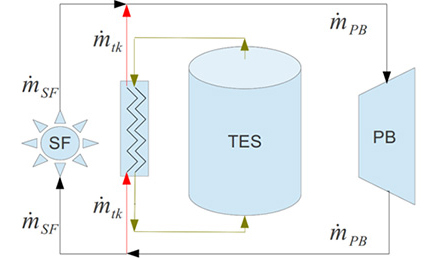 The computational methodology for the thermo-mechanical analysis of the TES systems is based on conservative finite volume methods and a parallel object-oriented engineering software. The parallel computational platform is based on NEST software developed by Termo Fluids S.L. 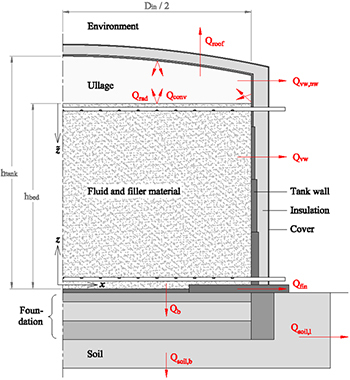 Conduction heat transfer through the tanks walls, insulation, foundation, etc., is modelled at the maximum level: multidimensional analysis with variable thermophysical properties. The storage fluid is characterized using advanced CFD analysis, or specially adapted lumped models in two-tank systems and detailed one-dimensional models in thermocline-like systems (e.g. standard or multi-layered systems using PCM). The different heat losses through the different parts of the system are fully considered. 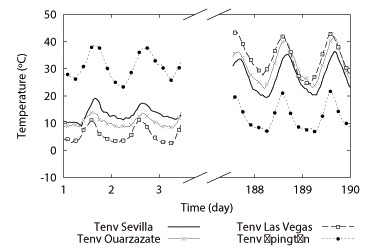 Different locations with their specific meteorological data can be selected (detailed temporal variation of the local solar radiation, ambient temperature and humidity, velocity of the wind, etc.). 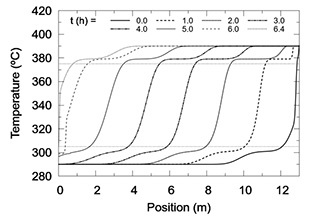 LTEScode evaluates not only the thermal and fluid dynamic behaviour of thermocline systems (see figures below), but also the transient evolution of tank wall stresses and deformations. It is then ensure that the tank is always working in the elastic regime, avoiding yielding or thermal ratcheting. 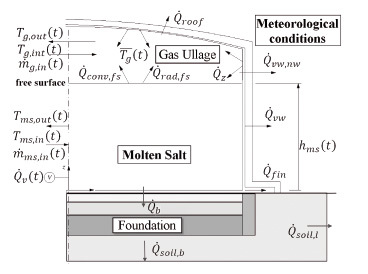 A detailed unsteady analysis of the foundation (different materials, passive cooling, etc.) is also carried out. Thermal wave propagation in the terrain along years is carefully predicted. All the relevant fluid dynamic and thermal design aspects are considered (e.g. in two-tank systems, the gas ullage or the convection and radiation effects between the heat storage fluid free surface and its surroundings). The codes have been carefully verified and validated. Numerical solutions are also verified to assure their independence of the numerical parameters used in the simulations. The codes have a friendly-user interface, and they take into account issues related to the cost of the system (CAPEX). Some examples of the graphical user interface are given below. The codes are conceived as a web-based software for designing purposes. The numerical models used in the STEScode and LTEScode have been developed to create powerful, robust, flexible and detailed codes with fast and friendly ease of use. 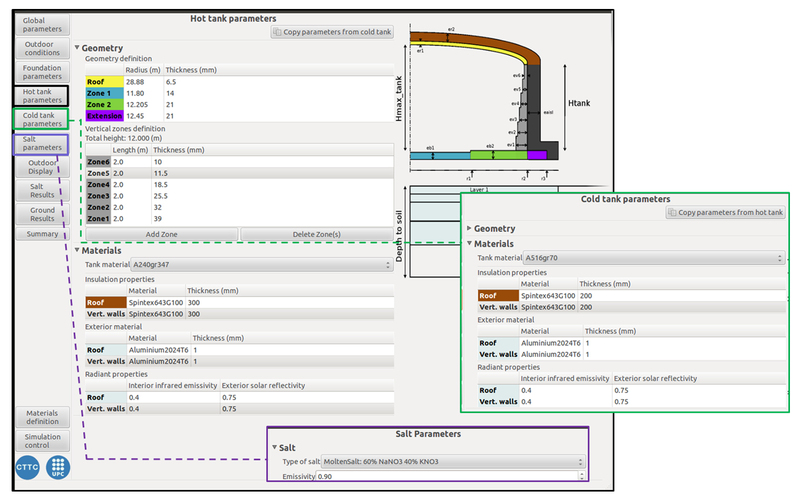 STEScode and LTEScode are powerful tools to provide effective and efficient design of the storage system in CSP plant.